Italian experts are proposing a dramatic new solution to the watery threat facing the city of Venice. Rather than battling to keep the sea out - they want to use it to help raise the sinking island-city. The scheme would involve pumping huge quantities of sea water into the ground beneath Venice down 12 pipes each of which would be 700m (765 yards) long. The sea water would make the sand beneath the city expand lifting Venice by 30cm (11.8 inches) in 10 years. The northern Italian city is slowly drowning - sea levels in the Adriatic are rising, and high tides are becoming more frequent. The Italian government is spending 4.5bn euro (£2.9bn) on a controversial project to build floodgates across the entrance to the lagoon in which the city stands in an effort to keep the sea at bay. Now, a panel of engineers and geologists from the respected University of Padua have come up with the new scheme costing just a fraction of that - 100m euro (£68m). 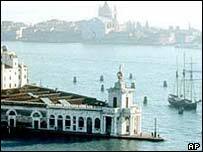 It says the plan would help raise Venice by almost as much as it has sunk over the past three centuries. The professor leading the project says it is not an alternative to the floodgates - but would work in tandem with them. He now wants to carry out a trial to see if the theory would work in practice. Not everyone is convinced. One expert - who helped stabilise the leaning Tower of Pisa - described the scheme as pure science fiction and warned it could damage the fragile structure of Venice. But the city's mayor is interested. He says it is time to look again at how to raise the city - and is convinced that the technology exists to make it a reality.